GETTING a home loan could be about to get a whole lot harder, thanks to the Financial Services Royal Commission. That's not just bad news for people hoping to buy - in Australia's home-loan-dependent economy, it could be very disruptive. The banking royal commission has been absolutely gobsmacking, and it is going to have serious consequences. ANZ chief executive officer Shayne Elliott said the inquiry would make the home loan approval process longer and more onerous. 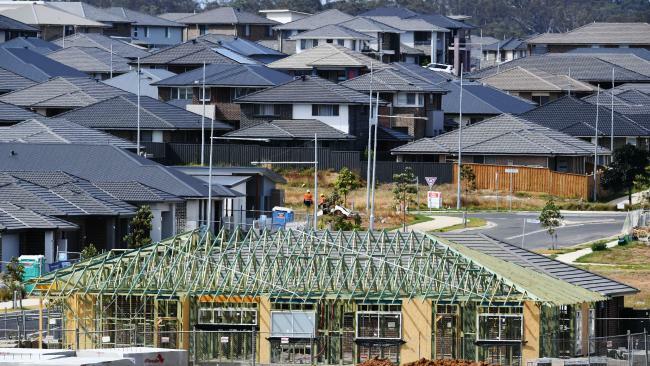 "People are still going to buy a home, so it doesn't change fundamental demand, but it will change the process and will probably make it harder for people to be successful in their applications," he told The Australian Financial Review. One of the biggest surprises from the royal commission has been discovering how lax banks have been when they hand out home loans. When you apply for a loan, banks are supposed to check to find out how much money you spend. They are supposed to know whether you shop at Aldi or the organic grocer, whether you're Mitsubishi or Mercedes, etc. But in fact, we learn, most approved home loans don't depend on any sort of actual assessment of your monthly spend. Instead, some banks use a measure called HEM (Household Expenditure Measure) for nearly three-quarters of loans. 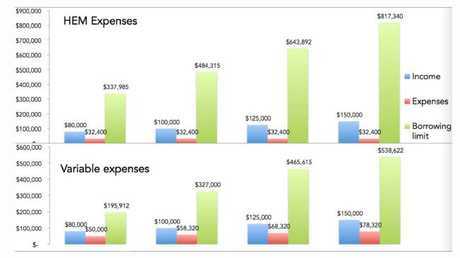 For a family of four, they simply write in the HEM expense measure of $32,400 a year. If you're thinking that'd be a generous budget, I can only assume you fell into a coma sometime around 1996 and have just woken up to read this story. I live in a family of two and we will probably spend that much by midwinter this year. Rent alone gets you pretty close, in the big cities at least. The long lazy summer of easy home loans is coming to an end. That is bad news for the banks - who make their money on them. It is also tough news to hear for anyone hoping to get into the housing market. If banks start to use more realistic assumptions about how much people can borrow, it is likely the size of loans available will fall. This next graph shows some analysis from investment bank UBS into how much smaller loans might be in future. Someone who could borrow over $800,000 under the HEM estimate could be restricted to $538,000 under a new and realistic assumption of expenses. Borrowing for housing is about to get a lot harder. More realistic assessments of expenses will lead to smaller home loans. Smaller home loans will make people less able to pay big bucks for houses. Fewer big spenders in turn, should lead to lower house prices, or at least slower house price growth. There's good news and bad news here. The good news is this: If you've been diligent and saved up a good deposit, and you're a frugal person who tries their hardest not to go to Bali twice a year, having the bank examine your actual expenses won't hurt. Plus now, when you go to an auction, the guy with the million dollar pre-approval and the leased German car won't be there outbidding you. For you, stern banks and lower house prices are a bonus. The bad news though, is that the Australian economy depends on house prices. 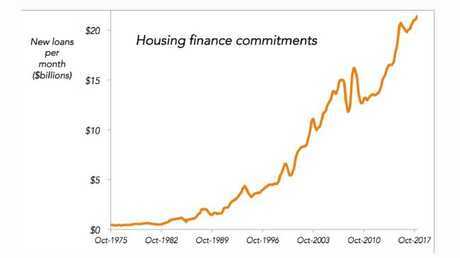 This next graph shows the incredible rise in monthly housing finance commitments in Australia. Huge growth to $21 billion in loans a month has been driving our economy ever onwards. That growth in loans, in turn, has fuelled the growth in house prices. Housing finance commitments are driving the economy. Picture: ABS Lending Finance, February 2018. 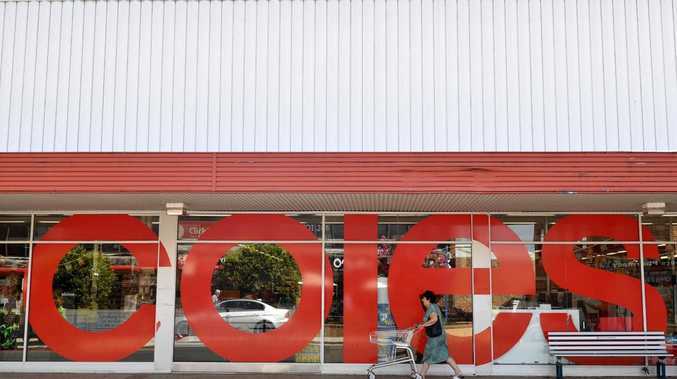 When house prices go up, Aussies go out and spend money in the shops, restaurants, hotels. That makes the economy hum. They call it the "wealth effect". If house prices fall, you hear the miserable sound of thousands of people cutting up their credit cards and pledging to live like paupers. In the worst-case scenario, it could cause our first recession in decades. 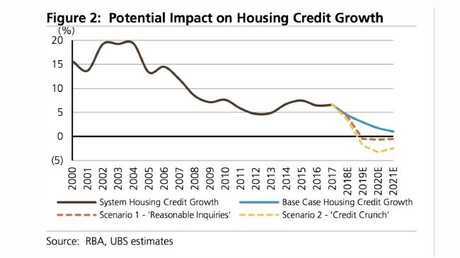 This chart, by investment bank UBS, shows how a "credit crunch" could see housing credit growth fall into negative territory. We are one of the most home-loan-dependent countries in the world and cutting back is going to cause withdrawal symptoms. This doesn't mean we should keep borrowing and lending wildly. It's just that we shouldn't have got so dependent in the first place. The banking royal commission is just helping us break our addiction and that is always going to be painful.